They are my most used ingredients in my cooking. When they are paired together, magic happens. 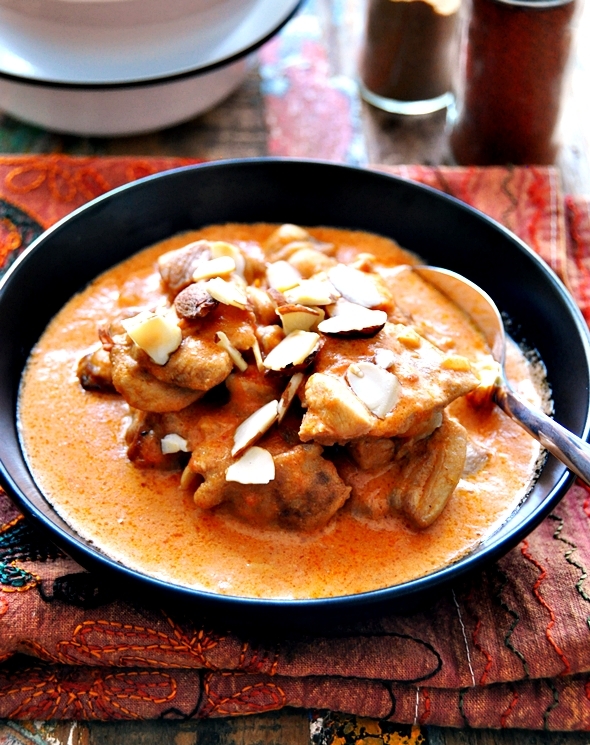 Think butter basted roast chicken or butter chicken – a popular Indian restaurant dish in Australia. 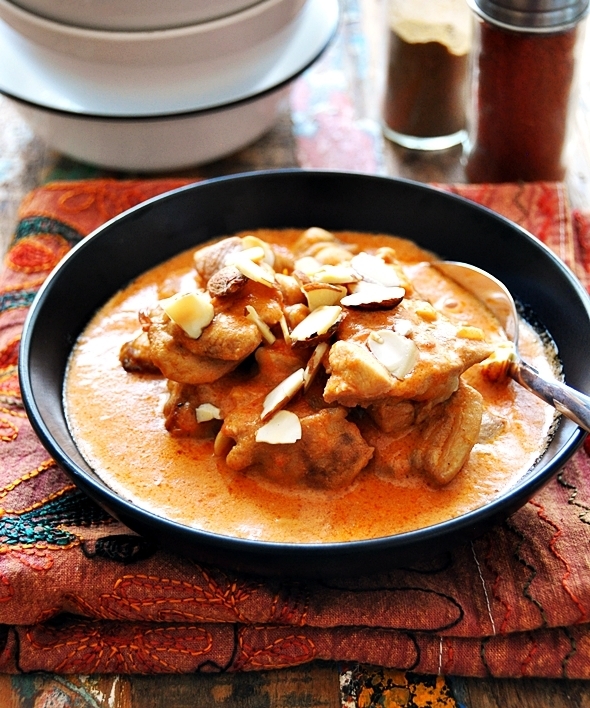 I’ve resisted the temptation of making butter chicken at home (for my beloved and I would go through it like no tomorrow) and I was under the impression that butter chicken is not an easy dish to make at home. Furthermore, when it comes to making Indian dishes at home, I wanted to mimic the real home cooked Indian dishes. Finally, I made an exception when I found a Butter Chicken recipe at the back of Sun Rice Basmati packet. I love going through recipes on the food packaging. Do you do the same too? What I love about this recipe is there is a mixture of yoghurt and cream. I reckon you can even tweak the ratio between yoghurt and cream to suit your fancy, but I just go with 1 to 1 this time. Another thing is you can get away with a limited variety of spices required in the recipe. This is a major plus if you don’t stock up a million different spices in the kitchen! A small handful of toasted almond flakes as garnish. You can also garnish with chopped coriander if you have some on hand. Heat 2 tbsps of oil in a large pan (or saucepan) and saute the onion until slightly brown over medium flame. Reduce heat to low, add garlic, ground cumin and chilli and saute until aromatic (add a little water if the mixture is a little dry). 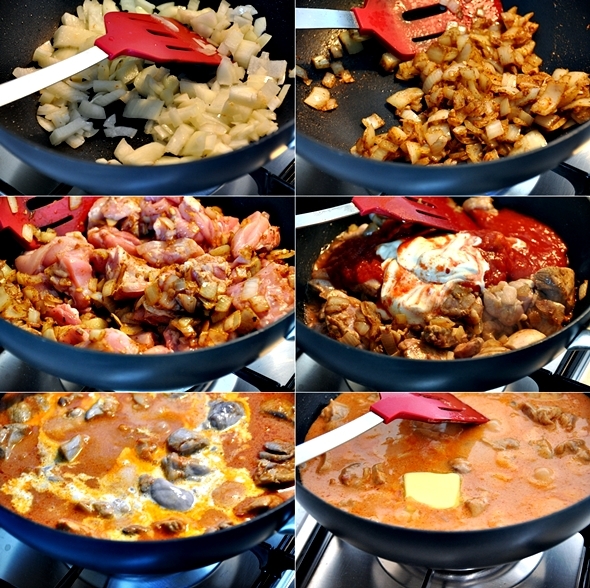 Add chicken and toss to mix with the pan mixture. Pan fry the chicken until 70% cooked. Stir in yoghurt and passata and mix to combine. Simmer with a lid on, over low heat until the chicken is cooked through. In the meantime, mix cream and cornflour in a bowl and try to dissolve the lumps as you stir. 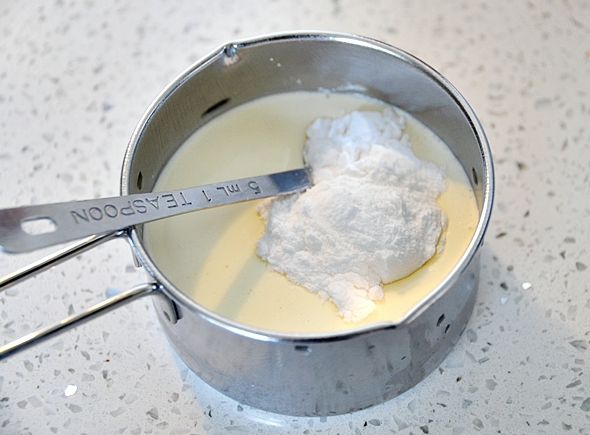 Pour the cream mixture into the pan and allow to mixture to bubble for an additional 10 minutes until it thickens. Lastly stir in the butter until it fully melted in the curry. Just before serving, scatter some roasted almond flakes and chopped fresh coriander. Enjoy! For 4 servings, cook 2 cups of basmati rice according to the packet instructions. This looks sooooo goooood! I will definitely give this one a try, soon. Thanks! Tomato passata is thicker, more concentrated and smoother in consistency as compared to crushed canned tomatoes; which means the gravy passata will be lush, velvety and the red is more vibrant. Should you wish to use crushed canned tomatoes, as recommended in the Kitchn article, you can “take plain canned tomatoes and run them through a sieve or a food mill”. Yum! That looks so simple too. For reason I always think that the recipes on packets will be too plain and boring for my sophisticated palate…haha! I have so wanted to try butter chicken for the longest time but thought the process was always so lengthy, this is definitely fuss free! Thanks, this will on my dinner table soon! Can I use tomato paste instead of the passata? Also, my brother’s girlfriend is from India and she made something similar to this dish for my parents when she visited. I wasn’t able to make if over for dinner. I am so excited to make this tonight!